Sony PSx - SHOP01MEDIA - konsoltillbehör och mods, retro - allt på ett ställe! What tools you need to "jailbreak" your PS3 depends on what firmware you have now, what type of console (NOR or NAND), how you would like to use it, with CFW and internal HDD or with a an ODE, externa USB disk etc.. There is many factors and options. We have all the tools but it's not an very easy task to do, you must search for the information and find out more before you start buying tools. Generally you will need FW 3.55 or lower to do anything on your PS3. If you have newer FW you must downgrade and here the problems starts... Some new cosnoles are not even possible to downgrade of what we know. If you have NOR console use E3 NOR flasher, if you have NAND use progskeet. 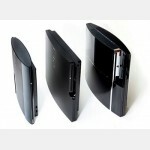 Sony PS3 serials and model guide.